DISCLAIMER: This post is about making a quilt. 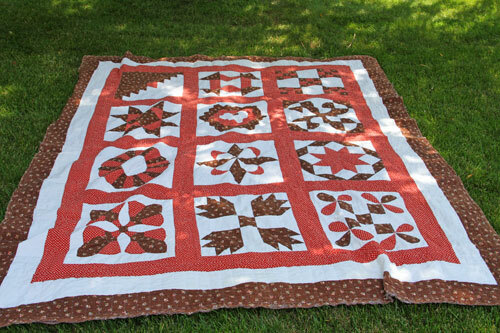 I have made a few quilts over the years but in no way am I am expert quilter or seamstress. My finished quilts are best viewed from afar. 🙂 I do come from a long line of quilters and have cousins who could be considered experts (Cathy and Bonnie I am talking about you). For me, I am just trying to hold on to the family traditions. With a new grandbaby in my near future, I decided to dust off the quilting skills that I learned many years ago and make a baby quilt. The year I got married, before kids, I took a year long quilting class where we made a full size sampler quilt totally by hand. No sewing machine stitches on this quilt anywhere. 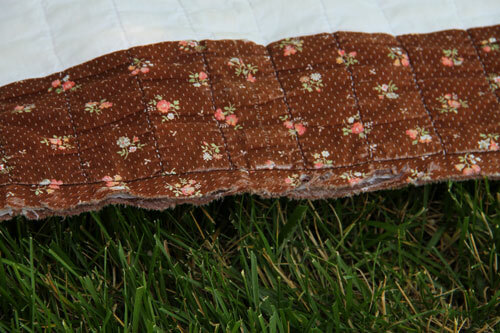 As you can see in the photo below it is a very used loved quilt…. 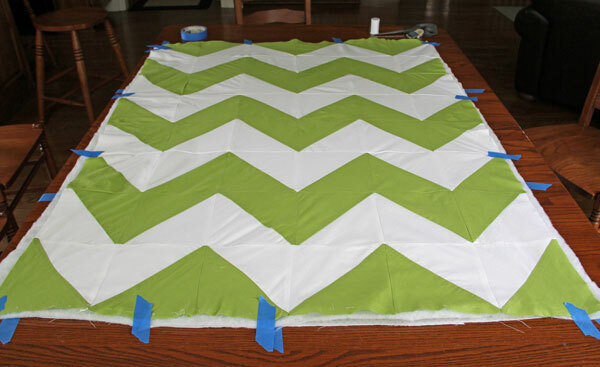 I have been inspired by some very bold graphic quilts I have seen on Pinterest so I knew I wanted to start with a chevron pattern. 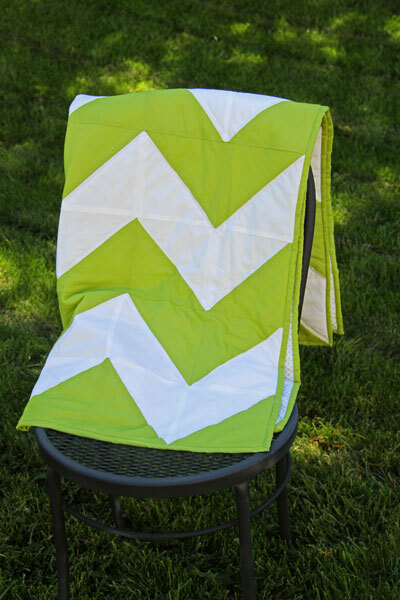 I came across a youtube video by the Missouri Star Quilting company that detailed how to make the chevron pattern for a full size quilt. To view that tutorial click here. 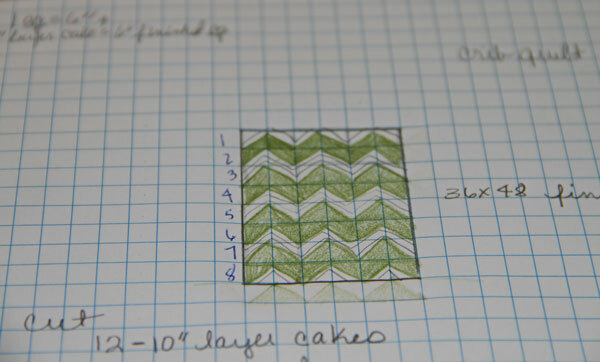 I thought I could probably adapt these instructions to a baby quilt so I got out the graph paper and started cyphering. Since that first quilt I made, I have not used a pattern on any other quilt, just a drawing that helps me visualize how to assemble it. 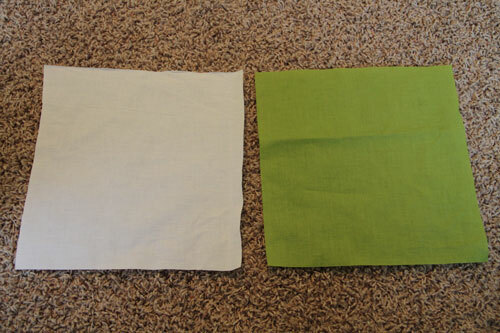 The first thing I did was cut 12-10″squares out of each color fabric. The tutorial mentioned making a “layer cake” which is a term I had not heard before. 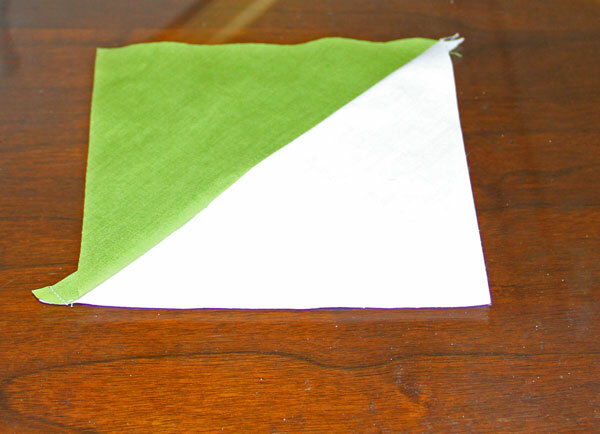 Basically it means sewing one square of each fabric together around all four edges. At this point I had 12 “layer cakes.” The next step was to cut each “layer cake” diagonally both ways. That creates 4 half square triangles per “layer cake” or 48 half square triangles in total. 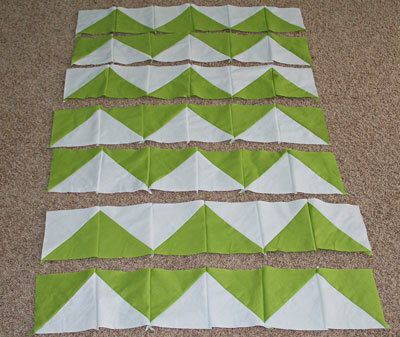 In the next step I sewed 6 half square triangles together to make a row. I repeated that until I had 8 rows. Now you just attach your rows together until you have the pattern you want. Once the rows are attached you are complete with the quilt top. 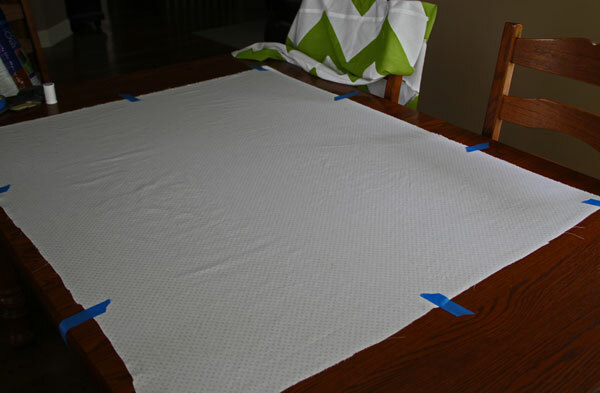 An easy way to assemble the quilt top to the batting and backing for a baby quilt is to tape the backing to a large table, making it as tight as possible. Then layer on your batting and quilt top. Once you have the quilt assembled you can either baste it or pin it. 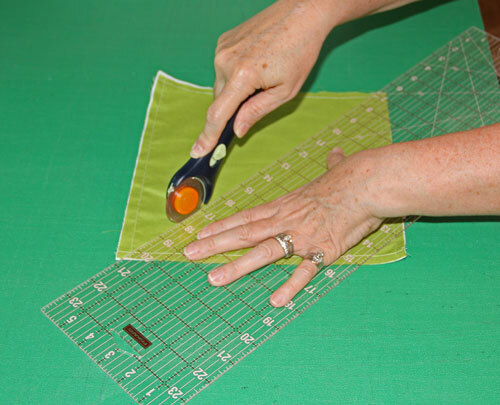 I have used both methods but since this was small and I was going to hand quilt it, I basted the layers together. Pins get in the way when you put the quilt in the quilting frame. At this point it was getting close to my daughter’s shower and I really needed to get done so I totally forgot to take pictures of the hand quilting or binding. 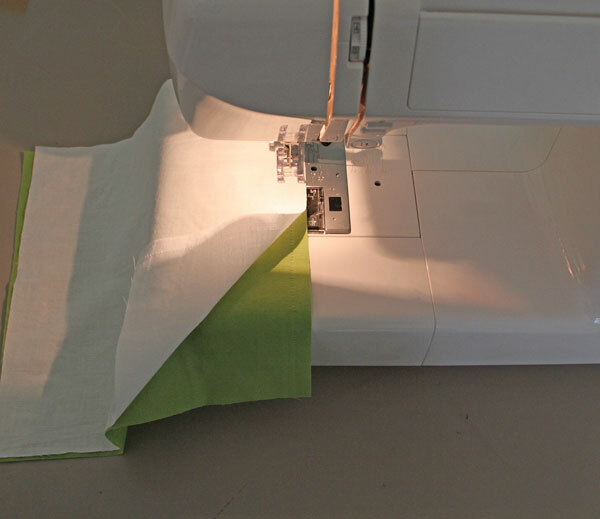 There are literally hundreds of tutorials on youtube showing you how to quilt and make your own binding and I am sure they do a much better job at explaining than I do. I did remember to take a picture of the finished quilt before I wrapped it for the shower. This was actually a fairly quick and easy quilt to make. I am thinking about making a full size version to use in my basement for winter TV watching! I should have that done when I am about 80! Thanks, Mom, for making such an awesome quilt for baby Levi and sharing your Spencer quilting talent! It looks great in his nursery and matches the decor perfectly!